Adhesives | Cal Fasteners, Inc.
We at Cal Fasteners, take pride in our great line of Zap Adhesive products, which provide the highest quality adhesives for any recreational pursuit. When trying to find an adhesive which is right for you, you want the supplies you use to be of the very highest quality. Whether building a model rocket, miniature railroad, or radio-controlled airplane, those who trust Zap adhesives know their projects are in good hands. Zap is durable, shock-resistant, and versatile. The specific formulas of Zap for use on plastic, fiberglass, balsa wood, and metal ensure that no amount of stress will cause a breakage or failure. Furthermore, the Zap line also covers products for maintenance and protection of engine parts, electrical connections, and canopies, to provide all around coverage of your project from construction to finish. 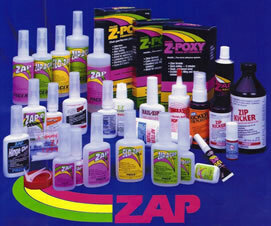 Many know that only Zap products are worthy enough to use on their cherished projects. Would you trust anything less on something you devote so many precious resources? Why accept anything but the best. Trust Zap, and never worry again.